President Trump's administration has all but given the green light for Bashar al-Assad and Vladimir Putin to destroy the Obama/CIA-backed rebel terrorist groups operating in southwest Syria. The United States has told Syrian rebel factions they should not expect military support to help resist a Russian-backed government offensive to regain opposition-held parts of Syria bordering Jordan and the Israeli-occupied Golan Heights. A copy of a message sent by Washington to heads of Free Syrian Army (FSA) groups, which was seen by Reuters, said the U.S. government wanted to make clear that “you should not base your decisions on the assumption or expectation of a military intervention by us”. This is the foreign policy Trump ran on! What a refreshing break from the bombing campaigns he previously carried out (which I suspect were done to get the deep state off his back)! The toughly worded statements had raised the hopes of the Western-backed opposition of a possible American military intervention in the event that the Syrian army’s bombing campaign broadens to an all-out offensive across the southwest. The notion we would kill this man and have another Libya and Iraq on our hands is insane. The U.S. message also told the rebels it was left to them alone to decide how to face the Syrian army’s military campaign based on what they saw was best for themselves and their people. “We in the United States government understand the difficult conditions you are facing and still advise the Russians and the Syrian regime not to undertake a military measure that violates the zone,” the message also said. That means do what you must. The United States has supported the moderate mainstream FSA faction with millions of dollars worth of arms and paid monthly salaries to thousands of rebels in the course of the seven-year war under a military aid programme run by the Central Intelligence Agency. But analysts believe the aid has dropped after U.S. President Donald Trump decided last year to shut down the programme. 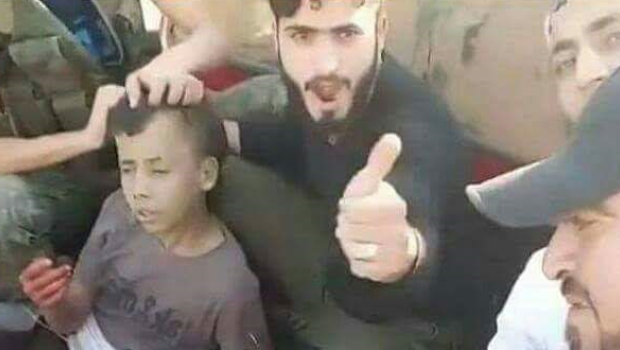 Those "moderates" are terrorists aligned with ISIS who film themselves chopping children's heads off. Assad and Putin want to crush ISIS and restore order in Syria and risk their own people's lives and treasure to do it.